The BoBunny Blog: An Oh So Wise Off The Page Wednesday! An Oh So Wise Off The Page Wednesday! Hello, hello! It's Off the Page Wednesday and boy do we have a fabulous project for you today! 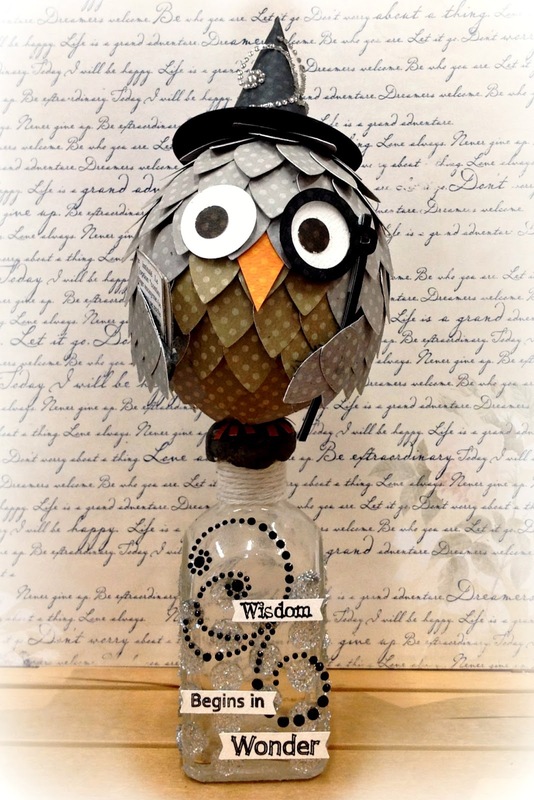 Owls are an absolute favourite of mine and the colours that come in the Neutrals packs just reminded of a Wise Old Owl, using a balloon and a leaf shape... Hey Presto my wise owl is born. 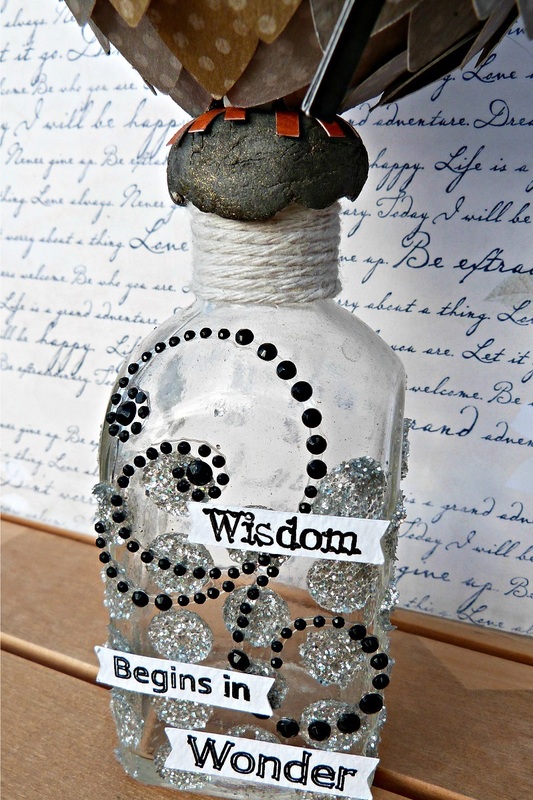 Of course he needs a perch and I sat him on a bottle that can be filled with wise quotes to inspire your day. To start I blew up a balloon to the size I wanted my owl to be, after a coat of newspaper and gesso it was ready for me to cover. I chose the soft grey Shadow Dot for the main colour of my owl and I added some Khaki Dot for the patch on his tummy, my feathers were created by cutting a simple leaf shape on my cameo and then glueing and layering them all over the balloon form. After this was done I popped the balloon and pulled it back out from the inside. 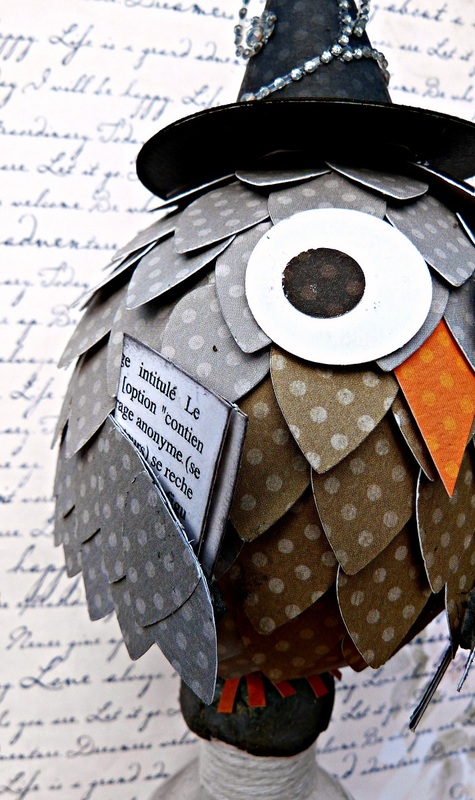 A wise owl wouldn't be complete without a book for which I used a couple of small pieces of the Dreamers paper from the Rose Café collection, donning his monocle completes the look. I used this small jar as a perch, the stickable stencils are perfect for surfaces that have a curve to them and I added silver glitter paste to the Brocade stencil to get a sparkly effect on the glass, for more sparkle and glam I added a Licorice Jewel Flourish and the printed my quote onto strips which I then glued on with pop dots. The lid of the bottle was made with some fimo and I sprayed it with Bronze Glimmer Spray which gives it an aged authentic look. He is now all ready to sit in my Craftroom and watch over me as I create. Doesn't get much cuter than this!